Yet here we are. 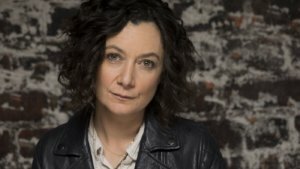 It’s a recent weekday and original “Roseanne” cast member Sara Gilbert, the mastermind behind the show’s return, is reflecting on the weeks that have passed since the sitcom’s blockbuster second coming. And all she can muster is a wide-eyed look as she shakes her head in disbelief. When Gilbert had the idea just over a year ago to revive the comedy, she was certain it’d be an futile endeavor. “I didn’t think the cast would be game, I didn’t know if I could only get some people and not others,” Gilbert, 43, insisted. But when her former co-star John Goodman appeared on “The Talk” and they revived their “Roseanne” characters for a comedy bit, the idea came up again — so she put in the asks. It turns out the cast was game. And so were viewers. The revival of “Roseanne” has established itself as a bright spot of mammoth proportions for ABC — and network television overall. In the midst of “Roseanne”s victory lap is Gilbert. The show’s triumph allowed star Roseanne Barr to return to the spotlight as a lightning rod of controversy. A flood of think pieces examined her support of President Trump and the show’s point of view in the divisive cultural climate. Seated at her publicist’s offices, Gilbert carefully considers some of the blowback the show has received largely fueled by Barr’s Twitter feed and outspokenness. As the driving force behind the show’s return, Gilbert is protective of its legacy. She was just entering her teen years when the show originally launched in 1988 and she remembers how it resonated as one of the few shows depicting a working-class family.